Welcome to District 12: Who is ANTONIUS?! 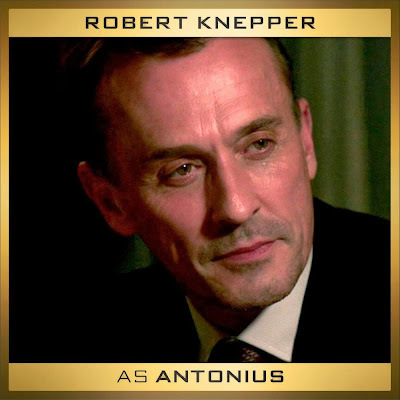 The Hunger Games fandom was surprised and confused this morning when Lionsgate broke the news that Prison Break's Robert Knepper has been cast as.......Antonius? You may be wondering..... Who the HELL is Antonius? The most likely answer would probably be that it is a new character. Since they are splitting the film (and rightly so) this is allowing for extra scenes to round out storylines. We saw what amazing things Francis did with extra scenes in Catching Fire, so I would not doubt the same would be true for Mockingjay. If this makes you nervous, I really wouldn't worry about it as Francis has said about Mockingjay (the same for Catching Fire) he wants to make the book. In our series Mockingjay Mockup, we've always mentioned how they are going to definitely add scenes for whats going on in The Capitol. Peeta and Johanna are there, therefore I'm sure we will be getting far more scenes with what's going on on their end. The most likely? He's a new character. But where does he fit in? He could be on Snow's team, something to do with Peeta's storyline (yikes! ), a member of Coin's team (that's my guess), or part of the military party that is the Star Squad. My very first theory was that Antonius was Dr. Aurelius. For those who don't remember, Dr. Aurelius is the doctor who is a key witness in Katniss' trial that helps her go free. He's a very important character, and Katniss' trial is something I am really looking forward to in the movies. But alas, there are issues with this thought. Aside from the fact that it would make his name sort of silly (Antonius Aurelius? Julia Gulia? ), I'm sure if this were the case they would have included his last name so that the public can identify the character is playing. Since they did not, I think it's unlikely that he is Dr. Aurelius. Sad face. I think Francis Lawrence has more than proved his worth and I completely trust him with any big decisions such as a new character. I hope we don't have to wait a whole year to find out who he is, but I guess only time will tell. *Update* According to The Wrap, he is on Snow's team. They refer to him as "Snow's minister". What's is your Antonius theory? Jennifer Lawrence is Nominated for a SAG Award!